As Britain gears up to celebrate the 100th anniversary of Roald Dahl’s birth and in the run-up to the launch of the film adaption of The BFG, VisitBritain is showcasing to the world what makes Britain a GIANT – and family-friendly – tourism destination. 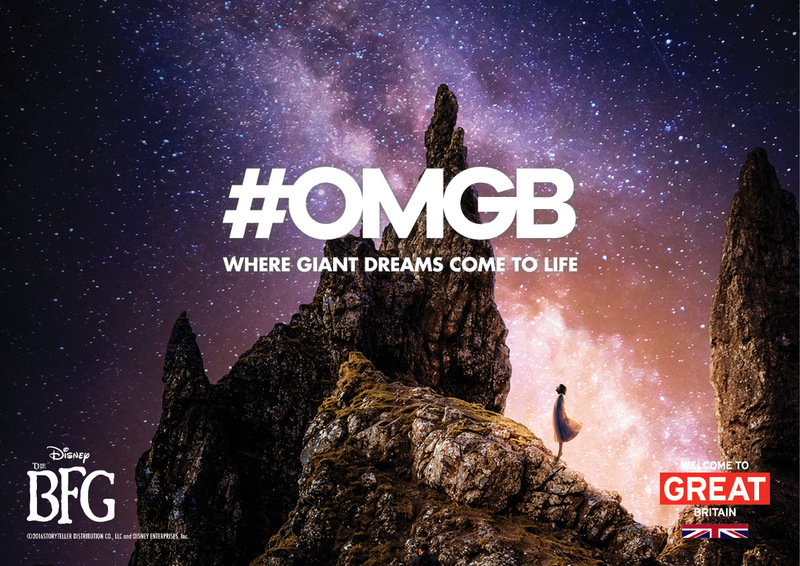 The national tourism organisation is today (Monday 20 June) launching an international ‘Where Giant Dreams come to Life‘ film tourism campaign in its first-ever collaboration with Disney, producer of The BFG. The film, directed by Steven Spielberg and based on the book by Cardiff born author Roald Dahl, was filmed at locations across Britain including Blenheim Palace, London, the Isle of Skye and Bamburgh beach in Northumberland. The BFG film launches in the US on 1 July and in the UK on 22 July. “Our collaboration with Disney on The BFG is a fantastic opportunity to promote to a global audience of millions an unexpected side of amazing, family-friendly moments that can only be experienced in Britain. Ms Balcombe said that the link between tourism and film – ‘jet-setting’ – was “a potent one” with recent films delivering a real increase in visitor numbers. VisitBritain’s campaign drives online ‘traffic’ to a BFG website on visitbritain.com/thebfg. The site has information on the British locations in the film, a ‘user-generated’ feed of #OMGB content, the official BFG movie trailer and details of visitor experiences linked to Roald Dahl and events to celebrate his 100th anniversary in September. Visitors to the site in the US, France, Canada, Russia and Australia can enter a competition for the chance to win a family trip to Britain, including a visit to Cardiff for its ‘City of the Unexpected’ celebrations in September. Paid media campaigns are also launching in the US and France across Facebook, newsletters and entertainment website ‘takeovers’. VisitBritain has more than 15 years’ experience in film tourism and film promotion is part of the cross-government GREAT Britain campaign.